1 x C12 DD 12 Volt M12 2-Speed Drill Driver. 1 x C12 ID 12 Volt M12 Impact Driver. 1 x C12 T 12 Volt M12 Lamp. Supplied in a toolbag, with 2 x 2.0Ah Li-Ion batteries and charger. The C12 DD 12 Volt compact combi hammer drill with single sleeve chuck for quick accessory change. With REDLINK™ overload electronics in both the tool and battery pack for excellent system durability. Compact and lightweight with slim line soft-grip handle. Capacity: Wood: 22mm Steel: 10mm. The C12 ID 12 Volt impact driver with heavy-duty full metal gearbox and gears for excellent durability. Compact in size, ideal for use in confined spaces. With REDLINK™ overload protection electronics. Bit Holder: 1/4in Hex Keyless. Impacts per Minute: 0 - 3,000ipm. The C12 T 12 Volt torch with 90° aluminium rotating head, which is impact and weather resistant. With magnetic back to allow hands-free use. 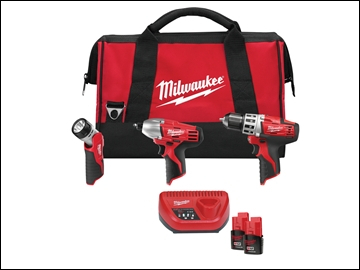 Works with all Milwaukee M12 Li-Ion batteries.